K-PAX is a 2001 American-German science fiction-mystery film based on Gene Brewer's 1995 novel of the same name, directed by Iain Softley, starring Kevin Spacey, Jeff Bridges, Mary McCormack, and Alfre Woodard. The film is about a psychiatric patient who claims to be an alien from the planet K-PAX. During his treatment, the patient demonstrates an outlook on life that ultimately proves inspirational for his fellow patients and especially for his psychiatrist. After claiming he is an extraterrestrial from the planet 'K-PAX', 1,000 light years away in the Lyra constellation, prot (not capitalized and pronounced with a long O, rhyming with boat) is committed to the Psychiatric Institute of Manhattan. There, psychiatrist Dr. Mark Powell attempts to cure him of his apparent delusions. However, prot is unwavering in his ability to provide cogent answers to questions about himself, K-PAX, and its civilizations. His medical examination only reinforces his story, as prot can see ultraviolet light and he is completely resistant to the effects of Thorazine. Powell introduces him to a group of astrophysicists who are befuddled when prot displays a level of knowledge about his claimed star system that was unknown to them. On July 27 as the hospital staff watch, the camera in prot's room cuts to static at the precise time prot said he would leave Earth. Powell finds Porter lying on the floor in his room, catatonic, prot having apparently left Porter's body for the light travel back to K-PAX. The other patients do not recognize Robert, as he is being wheeled out of the room. In addition, one of them is missing: Bess, a woman who had remained mute since her home was destroyed in a fire and who had been among the patients that asked to go to K-PAX with prot. She is never found. Powell continues to take care of the catatonic Porter and tells him about how the patients he helped have gone on to live normal lives again, but Robert does not respond. Powell is left with no absolute answer as to whether prot was in fact an alien entity or just a coping mechanism of the traumatized Porter, but seems far from convinced that Porter's behavior was a delusion. K-PAX received mixed reviews from critics. On Rotten Tomatoes it has an approval rating of 41% based on 139 reviews, with an average rating of 5.1 out of 10 with the web site's consensus stating "For those who have seen One Flew Over the Cuckoo's Nest or Starman, K-PAX may not hold anything new. The movie works best as a showcase for Kevin Spacey and Jeff Bridges." The film has a score of 49/100 on Metacritic based on 31 reviews indicating "mixed or average reviews". Roger Ebert wrote in the Chicago Sun-Times, "I admired how the movie tantalized us with possibilities and allowed the doctor and patient to talk sensibly, if strangely, about the difference between the delusional and that which is simply very unlikely.” A. O. Scott, wrote in The New York Times, "K-PAX is a draggy, earnest exercise in pseudo-spiritual uplift, recycling romantic hokum about extra-terrestrial life and mental illness with wide-eyed sincerity." 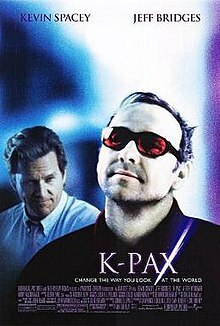 At Variety, Robert Koehler said, "'K-PAX' gives off a great deal of light but generates little heat in a drama that aspires to cosmic themes but ends up with plain, comforting homilies." Claudia Puig at USA Today concluded, "Besides being saddled with the year's worst title [...] this misguided movie is shackled by its own overreaching sense of importance and foggy earnestness." K-PAX was a box office disappointment making only $65,001,485 worldwide off a $68 million production budget, including $50,338,485 in North America and $14,663,000 internationally. Argentinian director Eliseo Subiela claimed that K-Pax plagiarized his 1986 film Man Facing Southeast; he said of K-Pax, "it's a copy, but a good quality one". Subsequently, Gene Brewer and others connected with K-PAX were sued in November 2001. The complaint was later withdrawn as the trial stretched over time and Subiela didn't have enough money to keep the litigation going. Subiela claimed until his death in late 2016 that his film was plagiarized by the makers of K-PAX. Brewer went on to release a memoir exploring his inspiration for the books, called Creating K-PAX or Are You Sure You Want to Be a Writer? ^ a b c "K-PAX (2001)". Box Office Mojo. ^ Ebert, Roger (2001). "K-Pax". Chicago Sun-Times. ^ Scott, A. O. (October 26, 2001). "FILM REVIEW; Now Arriving on Track 10: The 3:15 From Outer Space". The New York Times. ^ Koehler, Robert (October 25, 2001). "K-Pax". Variety. Retrieved November 8, 2017. ^ Puig, Claudia (October 25, 2001). "Loopy 'K-PAX' is lost in Spacey". USA Today. ^ "Subiela reitera que &#147;K-Pax&#148; es un plagio de "Hombre Mirando al Sudeste", pero de calidad". ^ "Other Books". GeneBrewer.com. Retrieved August 8, 2010. Frauley, Jon (2010). "Pathology, Power, and Medicalization in K-Pax". Criminology, Deviance, and the Silver Screen: The Fictional Reality and the Criminological Imagination. New York: Palgrave Macmillan. pp. 156–194. ISBN 9781349378869. OCLC 951516342. This page was last edited on 13 April 2019, at 15:22 (UTC).